Whatsapp is a cross-platform mobile messaging app which allows its users to send and receive messages from anywhere in the world without having to pay for it. You can read my earlier blog post on “Whatsapp mobile messenger” . Today I want to discuss how one can create group chat on Whatsapp. 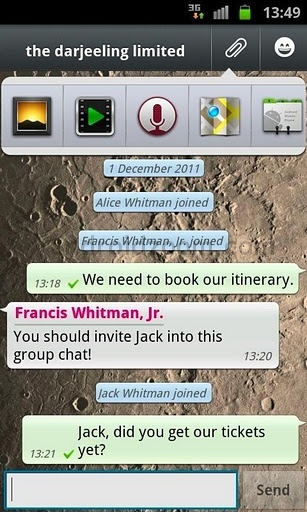 Group chat is one of the new features of the Whatsapp application but I won’t be surprised if many Whatsapp users don’t use this feature, it could be that they may not know how to create it and invite their friends to have a group chat with them, so that’s the essence of this post to teach you how you can create group chat on Whatsapp. After the invitations, choose create and the group will be registered. On successful registration, you and your invited friends can now chat in your newly created group chat room. group chat in Whatsapp is a more fun way of using whatsapp..i love group chats. Simply go to http://www.whatsapp.com and download the latest version of the application and install it overwriting the old one already on your phone then follow the instruction on the post. I have created a group in whatsapp and unknowingly I deleted and exit the group. now the person I added first is the admin of the group. can I get back the ownership of the group? I doubt you can be able to because you have relinquished your ownership of the group. Ask to be re-invited from the members. I am an group admin of a whatsapp group i want to know that can any option in this app that all members has received a right to join their known person into this gruop without my permission. So that when i shall not in available mode new joiny can join this group. I am an group admin of a whatsapp group i want to know that can any option in this app that all members has received a right to join their known person into this gruop without my permission. So that when i shall not in available mode new joiny can join this group.i want that every member has a right to join his known without any restriction. Whatsapp do not have such an option yet, maybe they may in the future or your can transfer the group administrator-ship to someone who will always be available to manage the group. I already answered you on the previous comment. in nokia 5233 there is no option as group chat when is select chat so can v create or cannot group chat in nokia 5233 ? You can create group chat in Whatsapp for all phone models. i created a group on watsapp. I added participants and thereafter, I cant find my group any more. its not as easy as locating groups of watsapp. can yu also help to know how to find groups on watsapp? Did you delete the Group? Else check if it is sorted in categories. What is the maximum number of members allowed on a group chat? How can you extend it to limitless number if possible? You can only have about 30 people in a group and nothing more. i am on ios7 and i need to add a new contact to an existing group for which i am admin. however i cannot find the info tab that i had on an earlier ios. how do i add this new contact? I wanna join some nice whatsapp group.. I am new in whatsapp..
Helo sir, can we have more than 1 admin for a group. No you can’t have more than one admin on a Whatsapp group. Ok fine sir.. I am very much impressed with your quick response to everyone, you are awesome. You are welcome. That’s what am here to do to help people solve problems. While creating a Whassapp group, can I only add the participants who have Whassap download and functional on their mobiles or can just add them with their telephone numbers also? If such users do not have Whatsapp they cannot be invited to join a group. 1) If I creat a goup in whatsapp, than will everyone in the group come to know about each other, or I only know them? 2) An an ADMIN of a group, can I delete a group? And after that can people in the group continue to know each other . 3) Can I creat a group of people, and ensure, that they do not communicate with each other. And only I can communicate with them. It is called a group, everybody can interact but only within the group and as an admin you can delete any member of the group at will. And no if you delete the group every member is gone and cannot communicate behind you except they shared contacts while in the group then they could chat independently. I’m using an oppo android smartphone jellybean 4.2.2. And cannot set up a group thread cause I cannot get the screen showing new group. I open whatsapp chat page, on top have on the left the green w/app logo and “chats” on right side a mag glass and my contacts list+ I can tap chats for a moment or hold for long and nothing happens.. please how do I call up the options page showing the options include new contacts. From there I’ll manage. Thanks.